Jonathan Roldan, renowned for his sport fishing excursions throughout the Baja, and his stunning wife Jill, invite you to their new "Fisherman's Paradise" on the Malecon in beautiful La Paz. The Tailhunter Restaurant & FUBAR Cantina with it's three floors of ocean views, a great place to enjoy a flavorful Mexican meal and have a couple of cold ones while hiding out from the Baja sun. Dining in La Paz offers the traveler a wealth of places to sample the fare from the Sea of Cortes. If it's seafood you're after, you have landed in paradise not only for the types of seafood available but also for the prices. Because La Paz is NOT a primarily tourist town, prices are scaled for the locals as well as travelers, which keeps the prices far below other tourist destinations. 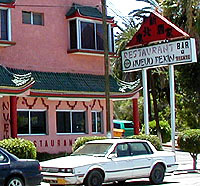 You will also find excellent Sonoran beef, chicken, pork and vegetarian food prepared in traditional Mexican and an array of Italian, Oriental, French and nouvelle cuisines at restaurants and hotels. The prices will range from $1.00 for a half dozen fresh chocolate clams from a street vendor to $25 lobster dinners at elegant restaurants on the water with views of the sunset that are unparalleled! And save room for desserts... the chocoflan will leave an unforgettable memory. Coffee shops with internet availability are also the rage... everywhere in town. True to all Mexican and Latin cities, nothing starts happening until 10 or 11 pm in the evening....and the party can go until 3,4 or 5 in the morning! La Paz has great places to dance and enjoy the music...all kinds of music from traditional to rock. You will find groups of strolling mariachis along the Malecon in the evening, live music at many of the restaurants and nightclubs that open for dancing around 9 or 10pm, and discos with the latest Latin and American pop/rock for dancing until you drop. If dancing and music are not your scene, a leisurely walk along the Malecon can provide hours and hours of entertainment watching the culture around you. Families, couples, friends and visitors all stroll the well-lighted Malecon and central pier in the evenings. 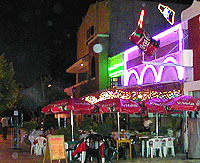 Walking about La Paz day or night is a SAFE activity for visitors. 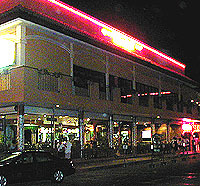 Shops are open late in the evening for browsing and buying. A walk at sunset with an ice cream cone along the water is such a tranquil experience...and La Paz has a fabulous ice cream place just off the central pier! Because La Paz is the center for cultural activities in all of Baja California Sur, the Teatro de Ciuidad (City Theatre) and Teatro Juarez have plays, concerts and special events practically nightly. During Carnaval (Mardi Gras in the US), there are activities, parades and dances nightly on the Malecon and in other locations. There are 2 movie theatres with a total of 6 screens, showing primarily American films that are subtitled in Spanish. You cannot beat the price at about $3.00, and on Tuesdays it's 2 for 1!